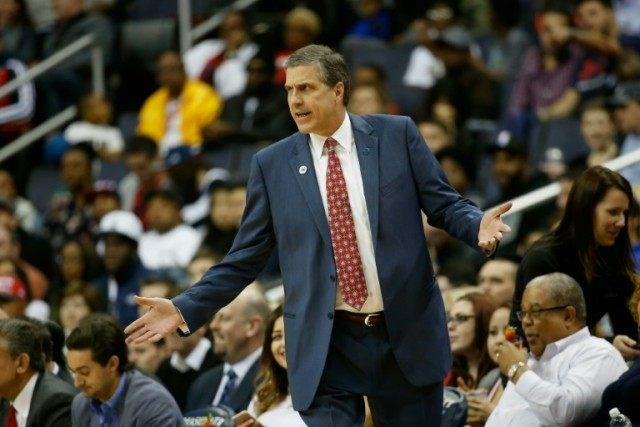 Washington (AFP) – The Washington Wizards parted company with coach Randy Wittman on Thursday, a day after the team wrapped up a disappointing campaign with victory over the Atlanta Hawks. “There were high internal and external expectations for this team coming into this season based on the momentum we had generated over the previous two years,” said Wizards President Ernie Grunfeld. Wittman was promoted to head coach in January 2012, and finished his tenure with a losing 178-199 record. The team had reached the playoffs in 2014 and 2015 but failure to do so this season — with the team finishing 41-41 — proved fatal. “This was a very tough decision on a personal level, and we wish Randy and his family the best moving forward,” Grunfeld said. The decision followed reports of turmoil within the Wizards organization ahead of Wednesday’s victory over Atlanta, with All-Star guard John Wall allegedly screaming at Wittman and team-mates during a furious practice bust-up.